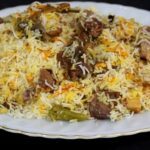 This recipe of Mughlai Biryani also called Biryani Badshahi. Biryani Badshahi is from the treasure trove of my snippets that I had collected over the years as paper clippings from various newspapers and magazines. Those were the years when for the first time I discovered my love and passion for cooking. With my baby steps into my mom’s kitchen trying with cakes, pulaos and biryanis. The rich variation of spices and complexities has always intrigued me. I love to try them first before learning how to roll circular rotis perfectly. More so, these are the dishes that gives you ample opportunities to play with the flavours. No two biryanis are made same even with same set of ingredients. To cook a good biryani needs patience. Good understanding of spices and the finer details of techniques involved in it. This is one such dish that can not be prepared in a hurry. It takes time and patience. Both rice and meat needs to blend gradually into each other, flavours need to intermingle. Meat should absorb the flavour of sweet smelling basmati rice. Rice should have the fragrance of meat and the spices. I don’t have many recipes up my sleeve, but only one that I have perfected over the years. To start with, choose meat that is right for biryanis. If that means going to butcher shop, then please go ahead. Ask specifically for biryani boti. The boneless meat does not add up that much flavour as the meat with bones. Except keema biryani. Because good quality meat is equally important as good quality of basmati rice in the dish. Always go for long grain basmati rice, with good flavour that can hold its shape. This is a royal dish is famous for the use of aromatic spices, which is a perfect fusion of taste and aroma. Mouthwatering royal badshahi biryani has fantastic aroma and flavor. If you're searching for a royal dish for your special guests or wish to impress anyone. 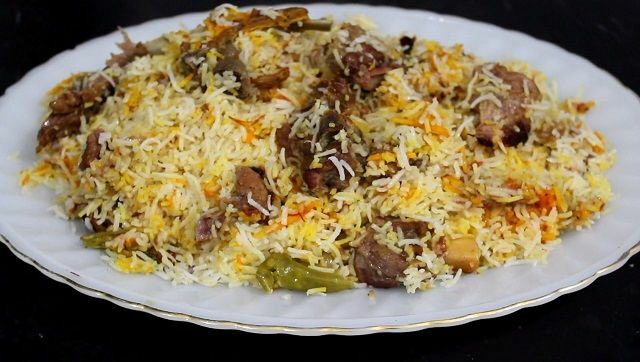 Then cook this mouthwatering royal biryani. Put 15 pieces green cardamom, 1 teaspoon black cumin seeds, 1 inch cinnamon stick and 4-5 pieces cloves in a blender jar and grind it into a coarse powder. Keep it aside for later use. Soak 1/2 tablespoon saffron in 1/4 cup water for half an hours. Soak 2.5 cup sela rice in 3 cup water for 3 hours. If you are using basmati rice then you can soak it for 30-40 minutes. To prepare this recipe, firstly, clean and wash the mutton pieces and keep it in bowl. Make a paste of raw papaya and apply this raw papaya paste on mutton pieces evenly. Now add, 1 tablespoon ginger paste and 1 tablespoon garlic paste again rub it evenly on mutton pieces. Then add 1.5 tablespoon lemon juice again rub it evenly on mutton pieces. Now add 2 teaspoon red chili powder, half teaspoon turmeric powder, 1 teaspoon salt and half tablespoon kashmiri red chili powder again rub well on mutton pieces. Add 1 tablespoon saffron water to it and again rub and mix well. Further add 1/2 cup fried brown onion and mix well. Now add 1/2 cup curd then again rub it on mutton pieces and mix well. Then add, 1 tablespoon chopped green chili, 2 tablespoon chopped fresh coriander leaves, 1 tablespoon fresh mint leaves again rub and mix well. Now add freshly prepared biryani masala and 2 tablespoon clarified butter then give it a final mix and rub well on mutton pieces. Cover the pan and keep it for marinating for 2 hours. You have observed we have added individual ingredients then rubbed and mixed it on mutton pieces. This helps to soften the mutton pieces before cooking. The better the mutton pieces gets soften the more evenly it will get cooked in mutton biryani. In a pan add 2 liter water and put over high flame. Add half tablespoon clarified butter, 1-2 slit green chilies, inch cinnamon stick, 3-4 green cardamoms, half teaspoon black cumin seeds and 2 and half teaspoon salt into water. Mix a little. Then add one-fourth teaspoon kewra essence into it. Kewra has a natural fragrance resembling basmati rice. Adding kewra essence in water improves the fragrance of rice further. When the water is near to boil add soaked rice into it and stir gently and cook it for around 4-5 minutes till rice gets half done. We need only half cooked rice as rest of cooking of rice will be done along with mutton in the biryani. To check, take out a grain of rice from water and press it between your thumb and index finger, the rice grain should break like raw rice on gentle pressure and should not be mushy. When the rice is half done drain the water from rice and spices. To prepare mutton biryani take a wide deep and heavy bottomed pan and spread the marinated mutton pieces uniformly in it. Sprinkle some chopped fresh coriander leaves, some fresh mint leaves and chopped green chili over the marinated mutton pieces in the pan. Now Sprinkle half of the boiled rice over the mutton. Then spread a layer of fried brown onions and then add balance of rice over it. Now spread saffron water rice. Spread 2 tablespoon clarified butter over rice. Put aluminium foil over it and close the lid tightly so that steam could not escape out. If you want you can also seal the edges of the pan with flour dough. Put the pan over medium-high flame for 7-10 minutes so that the steam gets developed in the pan. Then put the flame to medium-low and cook for 45 to 50 minutes. If you want you can also put some weight on lid to further protect steam from escaping out from pan. Switch off the flame and dish out your aromatic mutton biryani on plate and enjoy your royal biryani badshahi recipe. Serve hot with vegetable raita. 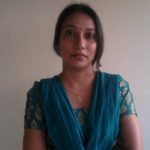 Normally I do not learn post on blogs, but I would like to say that this write-up very compelled me to check out and do so! Your writing taste has been surprised me. Thanks, quite great article.